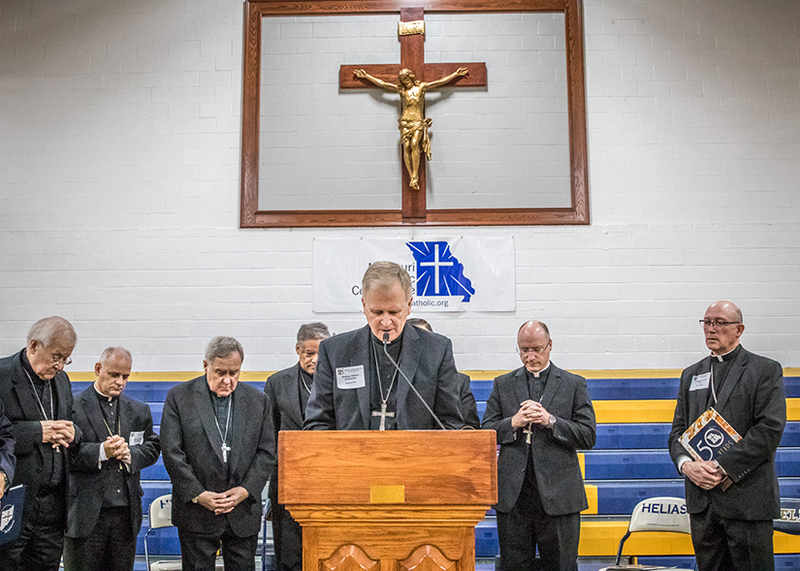 Auxiliary Bishop Joseph Perry of the Archdiocese of Chicago was the keynote speaker at the Missouri Catholic Conference Annual Assembly at Helias High School in Jefferson City on Oct. 6. He spoke about Pope Francis’ continual calls to go to the peripheries. Five years into his papacy, Pope Francis continues to call Catholics into the peripheries, and we have a duty to follow that call, Bishop Joseph Perry said. The auxiliary bishop of Chicago was the keynote speaker at the annual Missouri Catholic Conference General Assembly Oct. 6 at Helias Catholic High School in Jefferson City, Mo. The daylong assembly included workshops on topics including campus ministry, Catholic Charities and service to the poor and vulnerable, protecting the unborn, human trafficking, immigration, sexual and gender identity, the opioid crisis and the death penalty. Pope Francis has challenged Catholics to bring the Gospel to people in need — both geographically and in an existential world through a person’s experience of pain, suffering and indifference. Christ said that the poor stand “as a test of confrontation to what is found in human nature,” Bishop Perry noted. The peripheries include people who are ignored by hierarchical and governmental systems, as well as those who are illiterate or judged by their race or condition in life, immigrants and refugees, the imprisoned, those who publicly sin, the elderly, sick and unborn. “All of these and more have become subject matter of the catechesis of this papacy,” Bishop Perry said. Bishop John Gaydos, Bishop Mark Rivituso, Archbishop Robert Carlson, Bishop Joseph Perry, Bishop W. Shawn McKnight and Bishop Edward Rice joined in as Bishop James Johnston, front, led the opening prayer at the start of the Missouri Catholic Conference 2018 Annual Assembly. In Pope Francis’ 2014 Lenten message, he stated Christians are called to confront the spiritual, moral and material destitution of “our brothers and sisters, to touch it, to make it our own and to take practical steps to alleviate it.” Helping the poor doesn’t occur with just resources or alms, but only through “the poverty of Christ,” who emptied Himself of the worldly things and made Himself rich with God’s mercy and love, the pope stated. “There is only one real kind of poverty: not living as children of God and as brothers and sisters of Christ,” the pope wrote. In giving priority to the poor — the preferential option for the poor and vulnerable is a basic tenet of Catholic social teaching — we must understand how we are similar to those who are on the peripheries, Bishop Perry said. In what areas do we struggle with dignity and worth? “In linking arms with others on the margins, it helps to understand in truth how much we are like those the pope champions,” Bishop Perry said. Pope Francis is calling for disciples who are willing to move outside of their comfort zones. In the call for making the Gospel more relevant and improving society, it’s not a coincidence that many of the issues considered by state bishops’ conferences, including the Missouri Catholic Conference, are the same as the themes prioritized by the Holy Father. “Our state conferences must push for reason in an evangelical way with the issues plaguing life these days,” Bishop Perry said. “… We who exercise a lobby to get our leaders to recognize us and listen to us must show upright lives representative of the same values we expect our leaders to champion for us,” he said. In other words, those who call themselves pro-life on abortion must oppose the dehumanization of migrants, Bishop Perry noted. If we criticize the devaluation of life through physician-assisted suicide, we must also criticize the devaluation of life through racism. “The Church is a voice of reason within the wider community, while it is a voice for authentic discipleship among Catholic adherents,” he said. So why should we turn our attention to the people on the peripheries in the likeness of Pope Francis? “Because by Jesus’ hint, these folks will be obviously present in the kingdom,” Bishop Perry said. “Jesus was attentive to the marginalized, so we are attentive to the marginalized. The Missouri Catholic Conference is the public policy arm of the state’s Catholic bishops. The MCC is actively involved in all levels of government, especially state and federal issues. The agency promotes the common good by advocating for public policy that upholds the sanctity and dignity of all human life, including abortion, immigration, marriage and family, religious liberty, education, social and economic justice, criminal justice and the death penalty. To follow the priorities of the conference, visit www.mocatholic.org.